The Power Monitor kit (AC244008) consists of the power monitor board and an external power supply. 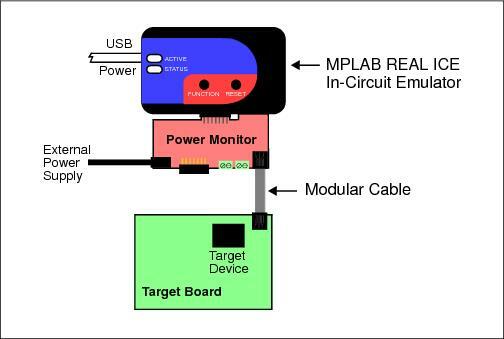 To use the Power Monitor, you must connect it to the MPLAB® REAL ICE™ In-Circuit Emulator and a target board. Power down the target board and disconnect the USB cable from the emulator. Disconnect any driver board from the driver board slot and remove any logic probes in the logic probe connector. Slide the Power Monitor board into the emulator driver board slot and logic probe connector simultaneously. Plug the Power Monitor power adapter into an AC source and then plug the barrel end into the Power Monitor board. For board layout, see Power Monitor Introduction. Modular (ICSP™) cable – for measuring the target board current. This connection is shown in the Figure in Step 2. Channel A (CHA) wire connection – for measuring the target board current and/or voltage. For details, see Alternative Target Power (CHA) Setup. Channel B (CHB) wire connection – for measuring the target device current and/or voltage. For details, see Device Power (CHB) Setup. The Figure below shows the internal connections between the Power Monitor and the target. Proceed to Software Plugin Installation to install the plugin that is necessary to use the Power Monitor.